The bottom boundary of this map of White Horse Vale is formed by the Ridge Way, an ancient grass track. The Wiltshire and Berkshire Canal runs through the centre of the landmass. 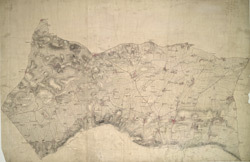 The elaborate hill-shading and the attention paid to communications routes conform to the military and cartographic standards employed by the Ordnance Survey. The manuscript is made up of three separate pieces of paper, joined together at a later date and attached to stiffer paper.